If the button presses are coming from outside of Vuo, such as TouchOSC, and each is identified with an index (1-16), you can use Get Item from List in place of Select Input, as shown below and in "Get Item From List as Select.vuo". Get Item from List allows for 16 or even more choices. 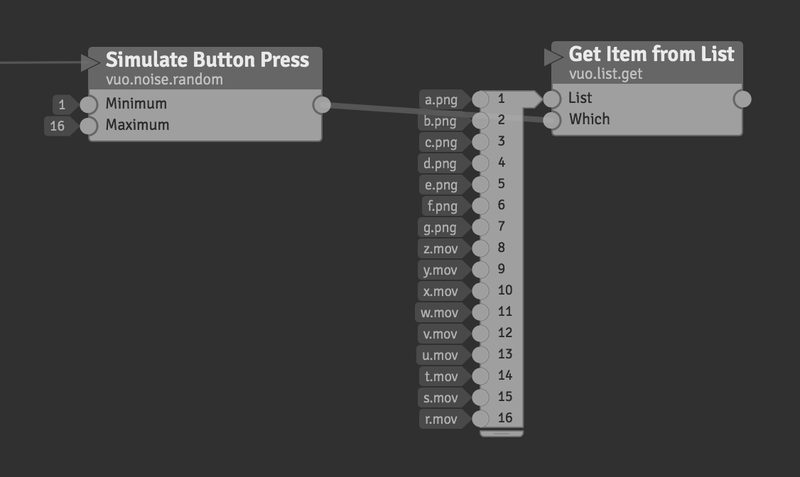 If the button presses are coming from Vuo's Make Button node, you can use a combination of two 8-input Select Latest nodes and a 2-input Select Latest node, as shown below and in "Select Latest with names.vuo". "Select Latest with indices.vuo" additionally shows how to convert a Make Button press to a numerical index (1-16), use the index to check if you should show an image or a movie frame (Select Output), and use the index again to choose the image or movie file (Get Item from List). Related feature request: Select and OSC nodes with variable number of ports. We've improved vuo.org to make it easier to follow discussions and give you control over your email notifications. You can now choose to follow a specific post, all posts in a section of the site (such as the Composition Gallery), or all posts by a specific user. Following means you get an email whenever someone makes a new post or comment. You can also unfollow posts. To learn how, see the FAQ How can I get notifications of posts on the Vuo website? Helpful descriptions, thanks. The part about "when the frequency scale of the graph is logarithmic" leads me to believe that the "accumulation modes" are similar to the Calculate Amplitude for Frequencies node's Frequency Bin Averaging options. Philip, agreed. 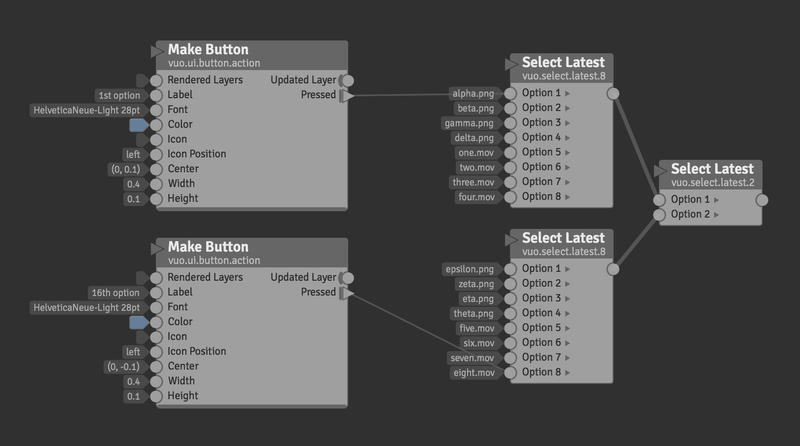 As part of this feature request, we'll plan to add a right-click menu item to collapse/uncollapse a type-converter node. Instead of the two-sided limit with clamp, you could do a one-sided limit with min or max — for example min(value, highLimit).